Progress toward gender equality enhances inclusion and promotes effective development. Gender bias contributes to underlying causes of all the grand challenges identified by CGIAR: Living within Planetary Boundaries; Securing Public Health; Promoting Equality of Opportunity; Sustaining Food Availability; and Creating Jobs and Growth. Scientists supported by the CGIAR Research Program on Policies, Institutions, and Markets (PIM) are working to provide solutions to eliminate this bias. 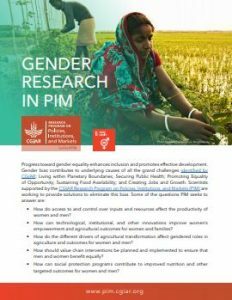 The new brochure summarizes selected recent findings and outcomes from the gender research in PIM.